« In our culture, why is peace so elusive? How is the vegan movement faring in challenging environments, such as the Moslem culture of the United Arab Emirates and the post-Apartheid society of South Africa? In this second and final part of our exploration (click here for part one), we’ll look at our recent visit to South Africa where we spent two weeks working with local advocates to share the vegan message. 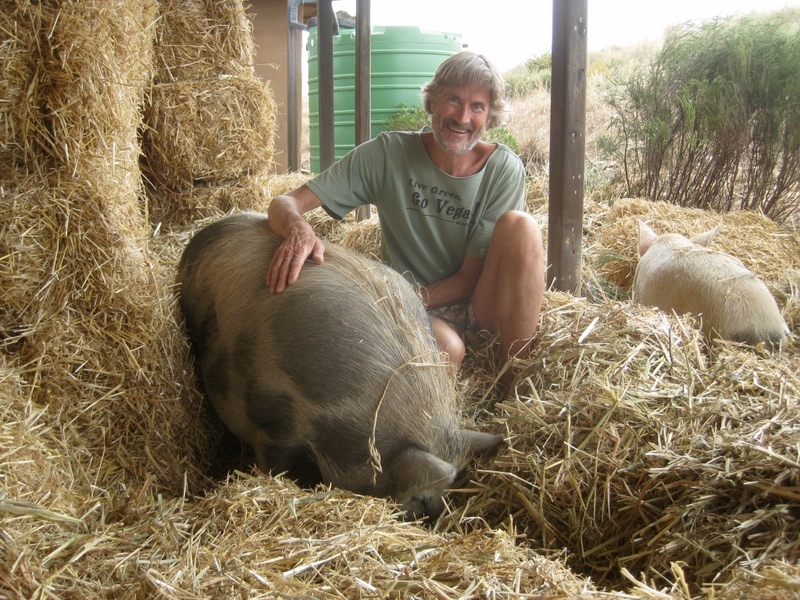 When we arrived in South Africa from Dubai, we went from living on the 31st floor of a post-modern urban high-rise to living with the rescued pigs and geese of Greyton Farm Animal Sanctuary nestled in the spectacular mountains and valleys northeast of Cape Town. 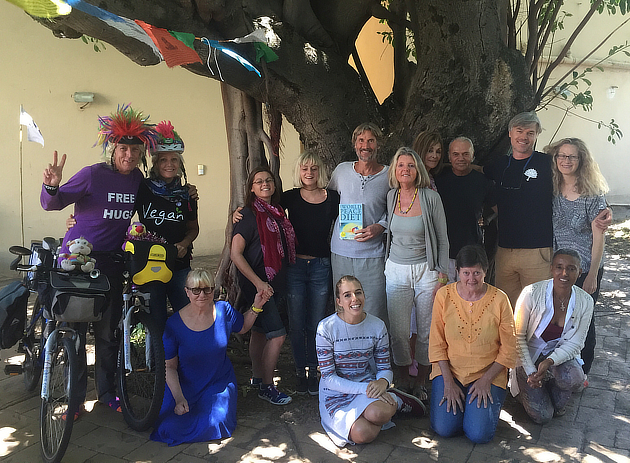 It was inspiring to meet the local vegan activists in Greyton, one of whom, Rohan Millson, had taken our World Peace Diet Facilitator Training five y ears earlier in Cincinnati, and has just published an encyclopedic book on the health benefits of veganism, Why Animals Aren’t Food. His book is the result of five years of dedicated research and writing and is a definitive and thorough response to the many arguments we vegans hear that promote low-carb diets and eating animal foods. Besides supporting a small vegan restaurant and the vegan animal sanctuary, the town of Greyton is also the only town in Africa that is officially recognized as a Transition Town by the Transition Town Movement, which is a global movement encouraging towns and cities to be more sustainable and self-sufficient rega rding food, water, and energy. 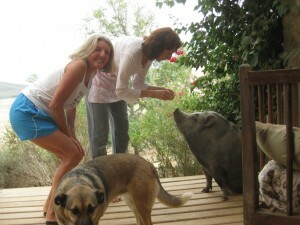 As part of their ongoing work to develop their Transition Town status, the residents of Greyton, led by Nicola Vernon, the proprietor of the sanctuary and the restaurant, have received a grant from Humane Society International to teach vegan nutrition, gardening, and foraging in the local schools. The main teacher of these skills is a young local African man named Marshall, and hearing about the inspiring success of his work with local children and their creation of school gardens to provide the community with organic foods was one of the highlights of our time in South Africa. Besides giving a public lecture in Greyton, we also facilitated a two-day World Peace Diet training workshop there where we were able to learn and share more deeply with local vegan advocates, all of whom impressed us with their openness and commitment to facilitating positive change. 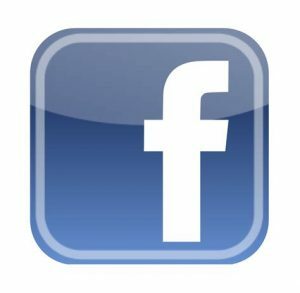 One, Brett Bard, a vegan veterinarian from the town of Prince Albert, is committed to creating a vegan education center there, for example. It was refreshing both to spend time with these activists and to experience the beauty of rural South Africa, with breaks to swim and hike in the canyons surrounding Greyton. Then it was off to Cape Town, the epicenter of vegan living in South Africa, and we were swept up in a whirlwind of media interviews and meetings with passionate vegan activists. Our first stop was Plant, the new and popular vegan restaurant. From there we participated in a heart-touching tree-planting ceremony with Anglican Bishop Geoff Davies, known as the “Green Bishop of Cape Town” for his outspoken writings on behalf of protecting ecosystems. The following evening we stayed in the countryside north of Cape Town with the founder of Plant restaurant, an energetic triathlete, and then returned the next day to Cape Town to climb Lions’ Head and enjoy the spectacular views, and also visited the famous Kirstenbosch Botanical Gardens where we saw many of the indigenous trees, plants and flowers of South Africa. That evening we presented a lecture at the Ubuntu Wellness Centre, a local holistic center promoting vegan living, and it was packed to standing room only. I had given two newspaper interviews, as well as one national TV interview over the prior two days, and these had helped to get the vegan word out to the South African community. 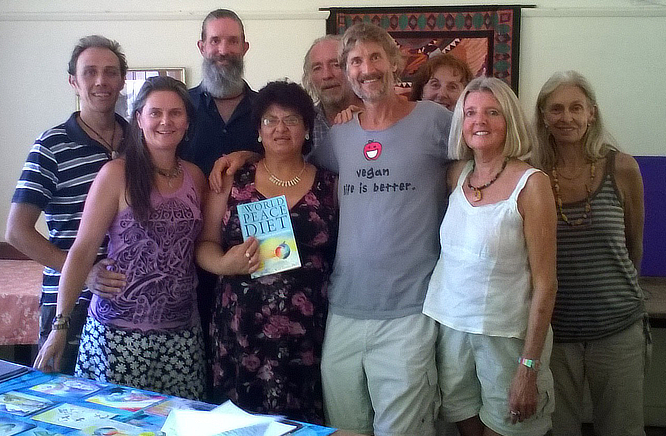 For the next two days, we put on the second World Peace Diet training at the Ubuntu Centre in Cape Town, and it was inspiring getting to know the local activists. 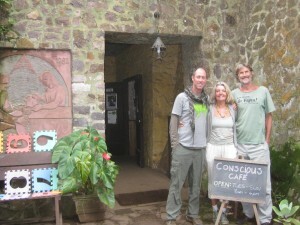 Ian and Dawn MacFarland, the founders of Ubuntu, were unstinting in their efforts to arrange and promote the events in the Cape Town area, and are local leaders in the vegan movement, helping to introduce the multiple benefits of vegan living to the local population through their holistic health center, as well as through public education events such as the ones we put on with them together. 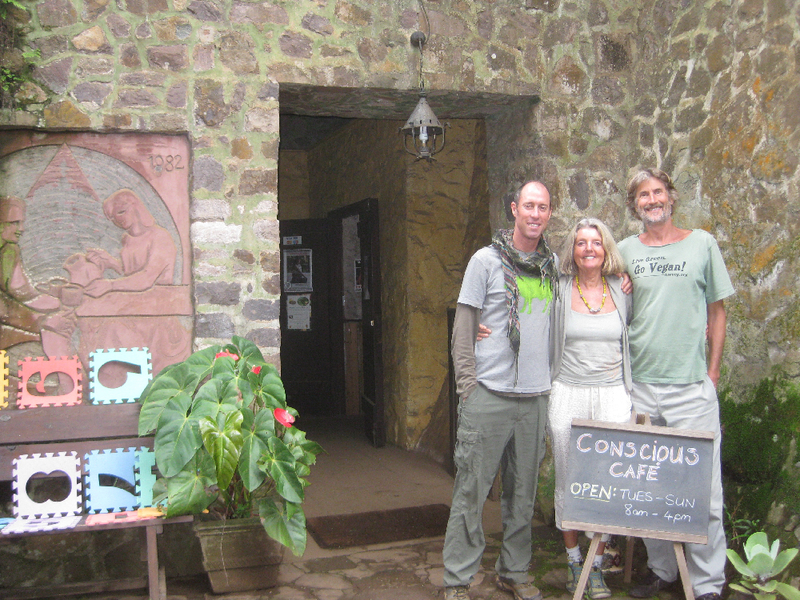 We also appreciated spending time with Andi Brand and Sven Fautley, two well-known local activists who have started the “VeloVegans” which is their name for their vegan outreach that features them bicycling throughout Africa with brightly colored costumes on, and sharing the vegan message as they go. 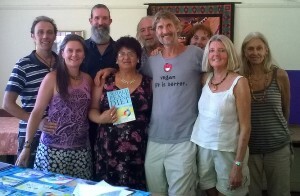 They have also gone through the World Peace Diet training and are pioneers in the vegan movement in South Africa. 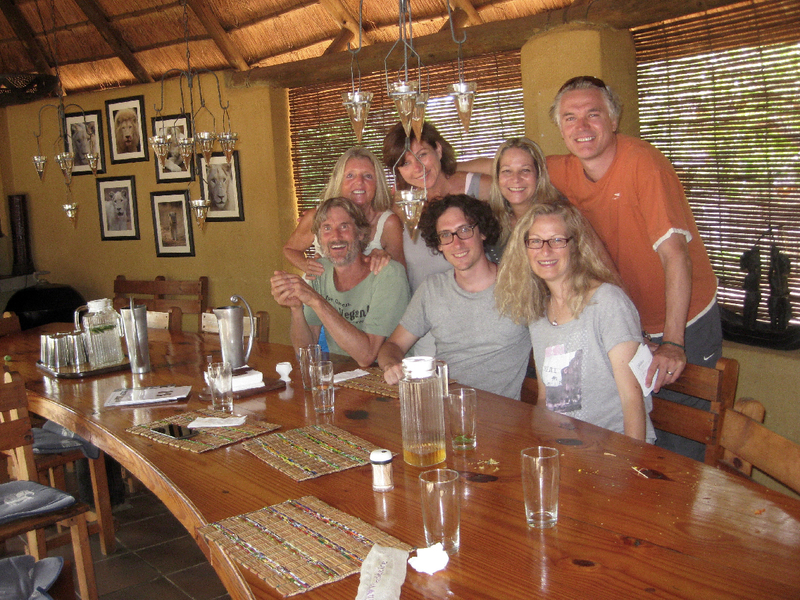 On Saturday morning, we flew to Durban and met André Rutishauser, another inspiring vegan activist who created the vegan restaurant in Durban, “Conscious Café,” where we had lunch. André is also the captain of one of the Sea Shepherd ships which is now on a campaign to protect fisheries off the coast of Nigeria. 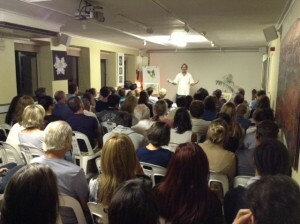 That evening we presented a well-attended lecture in Durban sponsored by the Vegan Society of South Africa and coordinated by its president Anna Jordan and the next morning we flew to the tiny town of Hoedspruitt near Kruger National Park for a three-day stay at the famous White Lion Protection Trust in Timbavati. 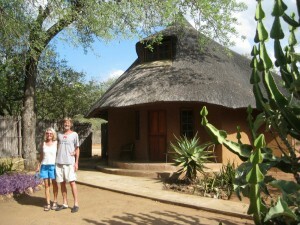 Founded by Linda Tucker, the author of Saving the White Lions and several other books about the mysterious white lions of South Africa, this wildlife preserve of 4,400 acres is home to the endangered white lions as well as many other animals such as wildebeests, elands, kudus, oryx, springboks, waterbucks, impalas, hippos, warthogs, caracals and many spectacular birds. Over the next three days we had the opportunity to view all these animals in the wild multiple times, and also to get to know the other vegans who gathered to be with us at this wildlife sanctuary, Dawn and Ian Macfarlane from the Ubuntu center in Cape Town, and Miki Haimovich and Adit Romano, well-known vegan advocates from Tel Aviv, Israel. We were also joined by Andrea Contri and Wynter Worsthorne, respected animal communicators from Italy and Johannesburg, respectively. This beautiful interlude where we had time to relax in the South African wilderness and see and hear the animals all around us gave a deeper appreciation for the plight of wildlife in Africa. We were surrounded, in the bigger picture, by farms, ranches and canned-hunting preserves, all of which are decimating the populations of wild animals in Africa. The most severe devastation is wrought by the spread of animal agriculture because as more people eat meat and dairy, more land is cleared for livestock feed and grazing, and the free-living animals, including elephants, lions, giraffes, zebras, leopards, and others, are ruthlessly killed as pests, and are disappearing as their habitat shrinks dramatically. 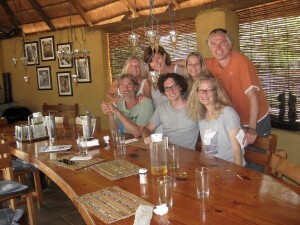 On Wednesday morning we took a shuttle to Johannesburg and arriving in the late afternoon, prepared for our final lecture event in South Africa hosted by the hard-working and enthusiastic members of the Johannesburg Vegan Society. 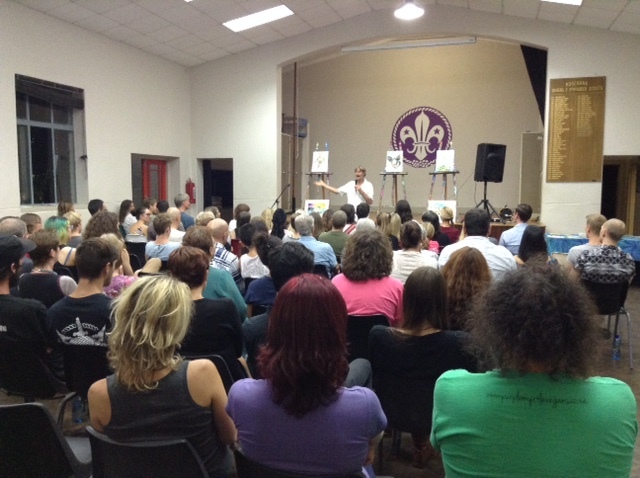 The president, Paul Palmer, did an exemplary job organizing the event with lots of help from local activists, and with the full-capacity attendance, abundant vegan refreshments, and hospitable accommodations with local Johannesburg vegan advocates, it was a memorable finale to our enlightening and inspiring sojourn in South Africa. We were also able to squeeze in this interview with Dr. Paul Palmer, with the delightful bird calls, including the South African Hadeda (Ibis) in the background to remind us of the other animals with whom we share this Earth.